Narcissus’ flower is a cut out. the blind buds are always. from the black river nets. it is voice brings us alive. red wings, a difficult birthing. & prevent voice from birthing out. Chris Murray is an Irish poet. Her chapbook Three Red Things was published by Smithereens Press in June 2013. A small collection of interrelated poems in series and sequence, Cycles, was published by Lapwing Press in autumn 2013. A book-length poem, The Blind, was published by Oneiros Books in 2013. Her second book-length poem, She, was published by Oneiros in spring 2014. A chapbook, Signature, was published by Bone Orchard Press in March 2014. 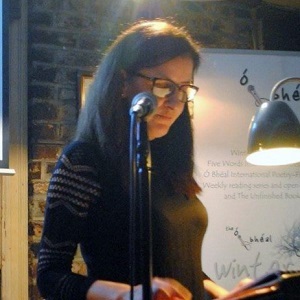 “A Modern Encounter with ‘Foebus abierat’: On Eavan Boland’s 'Phoebus Was Gone, all Gone, His Journey Over' " was published in Eavan Boland: Inside History (Editors: Nessa O’Mahony and Siobhán Campbell) by Arlen House in 2016.